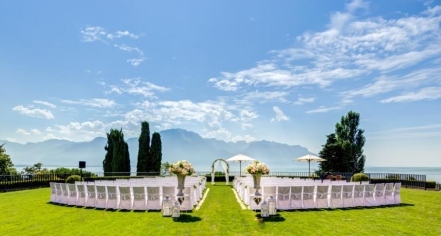 The most magical destination for a wedding in Europe is at Fairmont Le Montreux Palace. Just between the Swiss Alps and Lake Geneva, the snow-capped peaks and palm trees mingle to create a magical marriage of nature. Hold a grand wedding at the palace in the Alps for an unforgettable, enviable experience that will be talked about with awe and wonder for years to come. 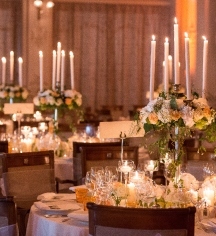 Having spent the better part of the last century figuring out what makes a wedding grand, the palace has experienced wedding planners to assist with every aspect of planning, including color schemes, complementary flowers, and delectable cakes. A team of experts guide the happy couple through the process from beginning to end for a stress-free experience. The palace has held galas from the beginning, and a wedding party is the perfect excuse for a grand, opulent celebration. Accommodating up to 1,600 wedding guests for an extravagant fête or an intimate gathering of 50 is the specialty at Fairmont La Montreux Palace. For a seamless beginning to a marriage, from first toast to last dance, with stunning views, palatial elegance, and grandeur, there is no better setting to begin a life together.